» That missing sign: What mystery? 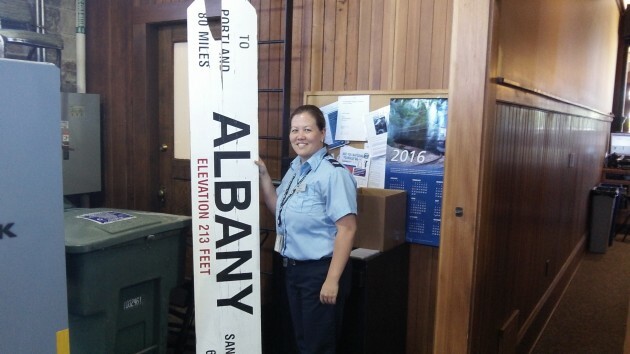 Amtrak’s Lori Komp shows me the missing sign where it’s kept at Albany Station. In early May I happened to notice that the “Albany” sign was missing on the side of the depot’s roof that’s facing west. What happened to the sign, I asked the city of Albany, the owner of the building. They didn’t know but said they would endeavor to have a replacement made and installed. The story appeared here on May 11. What I should have done instead was to ask somebody at the station, which I finally got around to doing on Friday. Any idea what happened to the sign that used to be on the roof, I asked Lori Komp, the agent who staffs the station on Fridays. Sure, she said. It broke off during the last snow storm we had. She had me go around to what might have been the store room for baggage, back in the day. And there was the sign, seemingly bigger than it and its twin look when they’re up on the roof where they belong. Fun follow-up to complete the reporting. Thanks HH! Would look good in a dorm room or as an apartment wall adornment. Perhaps too large as I see it next to Ms. Komp. Best that it be repaired and bolted back where it belongs! !